this is part two of my Sylvester menu. 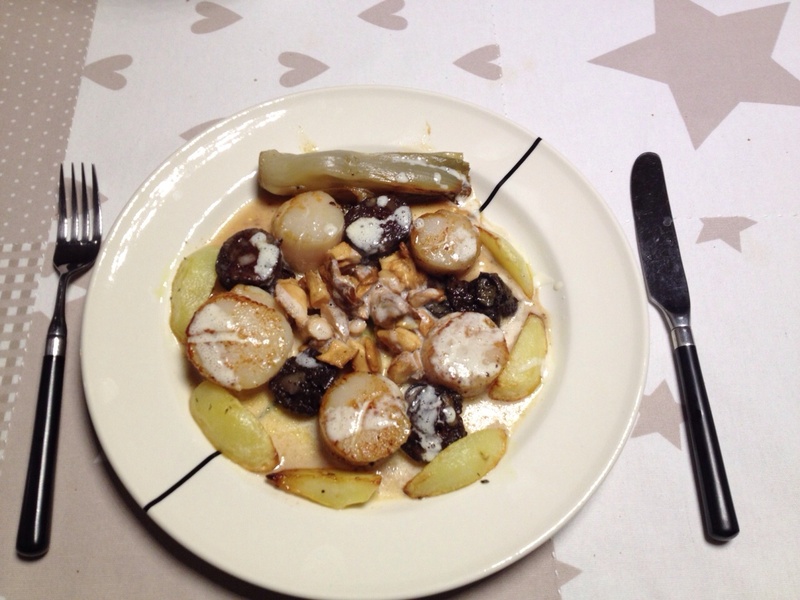 Scallops with blood sausage, also featuring chicory, wild mushrooms and potato wedges. Peel the potatos and cut them into mandarin-like slices. Chop the rosemary and the garlic and mix them with 3 tablespoons of olive oil. Grease the potatoes with the mixture and put the parts on a baking paper. Fry the chicories with some butter in a little water until they are fully cooked. Bake the shallot in some butter, and add the star anise, which will give a very special taste to the sauce. Add the fish stock and the white wine and let it cook until the sauce is reduced by half. Add the cream and let it simmer further for a few minutes. Add salt and pepper. Sieve the cause and put it aside. Heat the oven at 180° and put the potatoes in it for 30-35 minutes. Pat the scallops dry with kitchen paper. Otherwise they will cook instead of baking. Slice the blood sausage into pieces of approximately 1cm. Clean the wild mushrooms and slice them into pieces. Fry the scallops in a pan and add the blood sausage. Fry the wild mushrooms in a separate pan. Arrange everything on the plates and add a bit of sauce.